The wide-spread availability of phone-based communications, and the increasing availability of smartphones and tablets offers international development researchers, practitioners, and students an array of new tools and techniques for collecting field data. This includes new methods for administering surveys that can improve upon traditional pen and paper surveys with novel, real-time, electronic data capture. As adoption of ICTs by development researchers and organizations becomes more widespread, additional uses have emerged – from data collection for monitoring, visualization, and analysis. 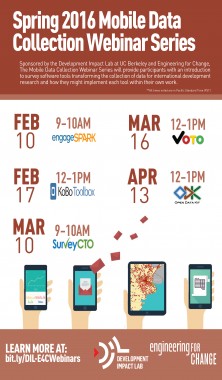 In collaboration with Engineering for Change, the DIL Mobile Data Collection Webinar Series provides researchers, development practitioners, and funders with an introduction to a sample of survey software tools transforming the collection of data for international development research and how they might implement each tool within their own work. An introductory webinar on the challenges and promise of mobile data collection in international development research. Voice IVR and SMS Text message, survey, and decision tree campaigns for social and behavior change. Mobile data collection for humanitarian response. Helping governments, aid organizations, and businesses better serve their citizens through voice and SMS communication. largest organizations to make more impactful investment and policy decisions. Free and open-source set of tools which help organizations author, field, and manage mobile data collection solutions.